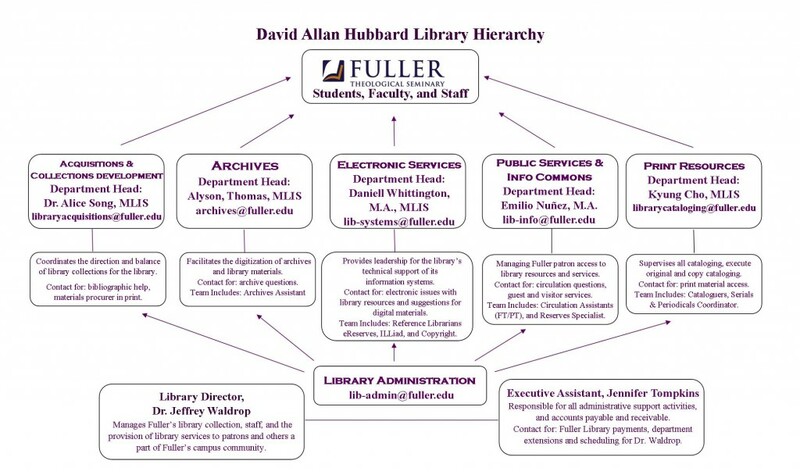 Dr. Waldrop has recently restructured the library staff into five distinct departments. Moving forward, if you have questions that fall under any of these departments, you will get a quicker response by contacting the department heads with the emails listed on the image below. Clicking on the image enlarges it and clicking here leads you to the Library Staff page; this page lists everyone, their departments, and contact information. If you’d like more information about the departments, please feel free to email lib-systems@fuller.edu. Thank you!